On Monday we told you that we’ve had a difficult and stressful time choosing new exterior colors for our house. Oh, the drama. Our first paint samples were too bright. The second ones were too dark. But the third ones were finally just right. Or at least we hope so because we’re pretty sure this is what we’re going with! Ugh, I sure do hope so. And since I’m sure you’re all dyyyyyying to know, or at least are mildly curious if you’ve made it this far … here’s our new colors!! (These are samples, of course. The actual painting hasn’t started yet.) Left side, top to bottom: Storm Cloud (SW 6249), Westchester Gray (SW 2849), Sands of Time (SW 6101); on the trim: Sand Dollar (SW 6099); and on the shutter: Inkwell (SW 6992) — all by Sherwin Williams. As soon as we put these paint samples up, it kind of clicked for us. We feel like they work well with each other and look appropriate for the age and style of our house. We’re really happy/relieved, and to make it better, our painter likes them too! Phew. 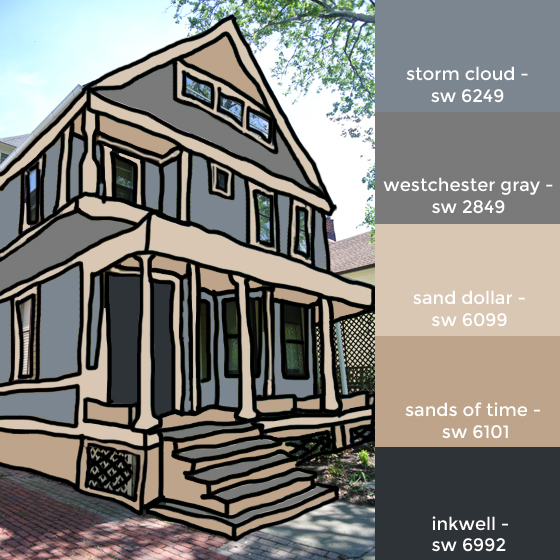 So, we explained on Monday how we need (at least) 5 colors: the main body, which is Storm Cloud; secondary body, Westchester Gray; main trim: Sand Dollar; secondary trim: Sands of Time; and window sash accent color: Inkwell. 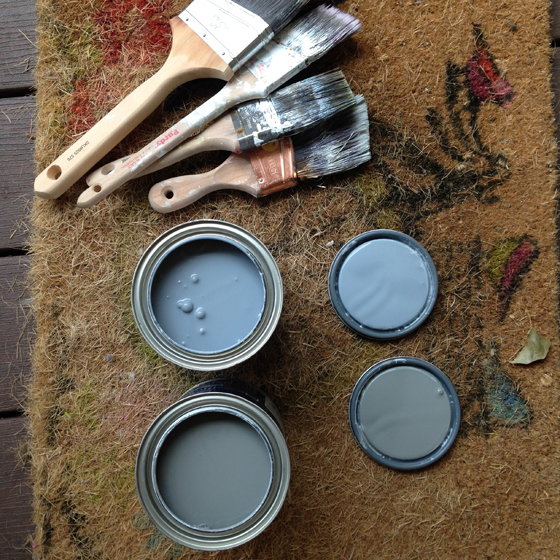 We’ll also have a sky blue ceiling on our front and back porches, which I’m kind of way too excited about. We might like to do something a little brighter and more cheerful for the front doors, since I think our current dark brown doors look sad and uninviting. We don’t want our house to look sad! 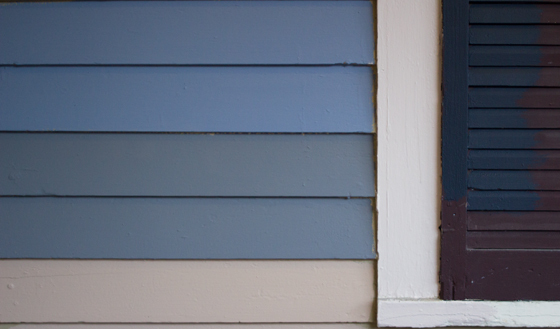 Do you have any cheery door-color suggestions for us to go with these colors? What do you think of our new house colors??? Me too! Yellow is my favorite for doors.